Sea Life London Aquarium is a popular attraction in central London. Since Merlin Entertainments bought and extensively refurbished the aquarium in 2007, it has delighted visitors of all ages with a huge variety of fascinating sea creatures and become a firm favourite with tourists. In 2016, Merlin Entertainments approached us with a themebook for a new arm to the attraction named Ocean Invaders. This new section would bring visitors into the world of jellyfish, with distinct theming and lighting setting it apart from the rest of the aquarium in an immersive, informative, interactive, and mesmerising experience. Putting our expertise to use, Pacific worked with the Merlin team to execute the plan to the highest standards possible. The Ocean Invaders experience is divided into three zones: "Discover Jellies", "Understand Jellies", and "Wowed By Jellies". Each zone has its own unique features but maintains similar colours and lighting levels along with an ambient electronic soundtrack to mirror the hypnotic movement of the jellyfish. Zone 1 focuses on introducing visitors to the basics of jellyfish: their life cycle, their needs and role in the ocean, and how they are bred and looked after at Sea Life. At the entrance, we installed a horizontal mister to produce a constant 1.2m-high stream of mist which acts as a moving screen for an Infocus short throw projector, creating a ghostly mid-air effect of jellyfish swimming across the archway. The first area features a number of Samsung displays, playing video and audio content via Brightsign media players to accompany the live jellyfish tanks, which are illuminated with coloured light using LED RGB strips and diffusers. One particular tank is equipped with a transparent LG display to educate visitors about the life cycle of the jellyfish alongside the animals themselves. All displays and tanks are built into the walls to allow ease of movement within the attraction. Overhead, three coloured lighting effects evoking jellyfish tentacles are achieved using LED tape and diffusers. This section closes with a massive moving image of the giant lion's mane jellyfish, produced by an Optoma ultra short throw projector, which dominates the facing wall. Zone 2 heavily features interactive exhibits to stimulate visitors' imaginations, ranging from a relatively simple colour-changing jellyfish tank controlled by a touch screen, all the way up to a giant video game for up to eight players. 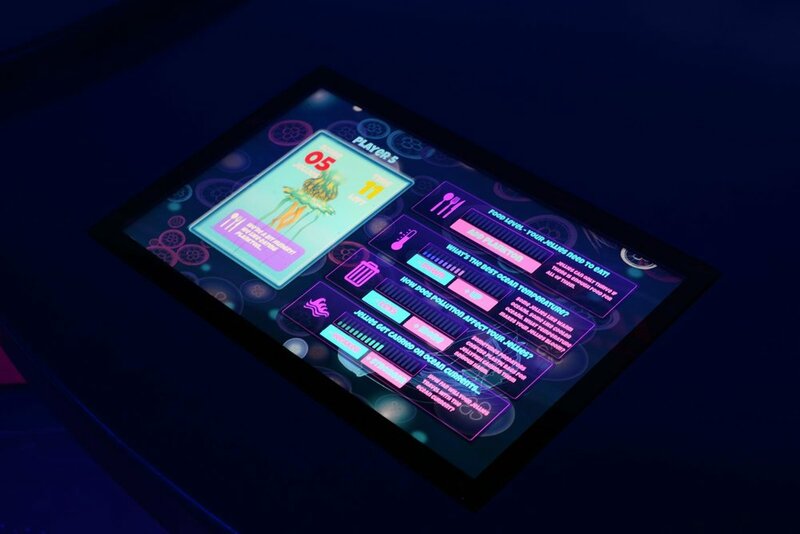 The game allows players to create a swarm of jellyfish via eight Iiyama touch screen displays set into themed desks. The action takes place on a huge 7m-wide display projected by two high-end Optoma projectors, using edge blending to create a seamless image. Elsewhere in Zone 2, an interactive Hitachi projector allows visitors to access information using hand gestures. Nearby, the infamous jellyfish sting is simulated – visitors are encouraged to poke their hand through a hole in the wall to touch a plastic tentacle, when a CF IV audio player plays an electric shock sound and an accompanying bass shaker thrills the user with rumbling movement. The overhead lighting continues from Zone 1 to Zone 2, while 50 unique jellyfish-themed lights also hang from the ceiling, each with its own individually-controlled LED. All lighting and audio in this zone, including the skirting and tank lights, is controlled by DMX. The final zone is designed to wow visitors by bringing them into the heart of a giant swarm of jellyfish in the deepest of oceans. Along with large tanks of mature jellyfish, this U-shaped area surrounds customers with imaging on all sides, including the floor and ceiling. The back wall features a 7.6m-wide image of hundreds of jellyfish, achieved with five edge-blended Optoma projectors. The ceiling is made up of ultra-black transparent perspex panels with imaging provided by Optoma projectors, while five ROBE MiniMe spinning head Gobo projectors allow video content to move across the floor. All AV, audio and lighting is controlled via an Alcorn McBride 16-channel Protraxx and a Pharos controller. By highlighting these misunderstood and fascinating creatures, Ocean Invaders provides an enthralling and genuinely memorable closing act to an already thrilling experience. The attraction has proven a hit with customers.